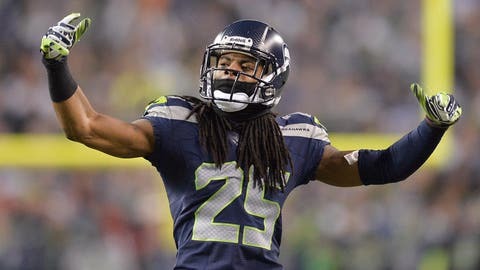 Richard Sherman created a stir with his postgame comments in the NFC Championship Game. Critics called him divisive, egotistical and "not a team guy." One week later, the Seahawks cornerback — who was part of a Beats By Dre advertising campaign — handed out customized pairs of the fancy headphones to each of his Seahawks teammates as they prepare to embark to New York for Super Bowl XLVIII. Beats By Dre paired with Graff Diamonds to create the custom Beats Pro headphones. Members of the Broncos will also receive a pair, too, according to a news release from the company obtained by FOXSports.com. Call it a brilliant marketing move on behalf of Beats By Dre to have the fashion-forward headphones on each player during Super Bowl week.